On the 25th July 1987, Sunway College Opened its doors in Petaling Jaya exactly 30 years later to the day, the Sunway Education Group held a magnificent party to celebrate, an evening truly worthy of such an achievement . The evening started with Candy Floss stall, Hot Dogs and refreshments being served to our guests from the wide range of booths available, all supported with fun fair activities for our younger friends. Many young students from the popular Sunway’s Got Talent performed as the crowd eagerly anticipated the great event of the evening, and what a build-up it was. The Merlin Award Winning Magician Mahdi Moudini wowed the crowd before disappearing and then magically reappearing on top of the 12-storey university building to spectacularly launch the event, an unbelievable feat to start the show. Over 3000 Glow Sticks added a wonderful colour to the proceedings as 4000 happy students lit up the night sky at Sunway City as the projection mapping show began. 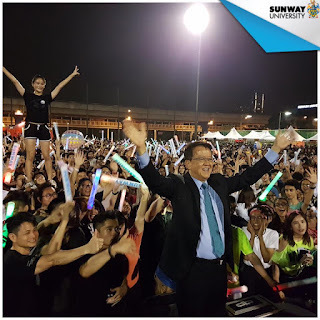 The 30 minute laser light show featured all the magnificent milestones of the successful Sunway Education Group Journey and had the thousands in the crowd dancing with joy. The event attracted 10 different camera crews from all across the globe who came to capture the event and it was also widely covered across all local media. At the end of the show Tan Sri addressed the crowd and was quite overwhelmed by the glorious reception from his students. It was a memorable night as another magical milestone in his remarkable story was achieved. Another Sterling Performance from MUFY!